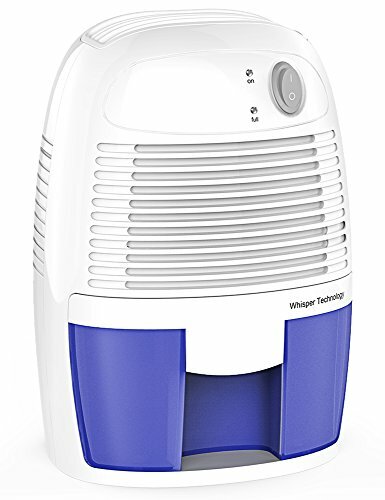 This portable mini dehumidifier with an easily accessible collection container, full water indicator and a press power button for easy operations. Powerful function reduces bacteria, room odors and other airborne particles in the air. Keep a dry and clean environment and protect your clothes, electronics and other delicate things from damp, harmful mold and mildew, etc. 1. 500ml capacity water tank. 2. Auto-Off and LED indicator when the water tanks is full. Before using the dehumidifier, please check whether the environmental humidity and temperature have met basic requirements, temperature ≥ 20 ℃, relative humidity ≥ 60%. In this environment, the dehumidification performance is better. 3. This is a mini dehumidifier for small spaces, the dehumidification capacity is limited compared with the air compression dehumidifier,cannot accept the dehumidification capacity the buyer please discretelty to purchase. ★Healthy & Quiet: Creates a healthy environment by eliminating bacteria, for those with breathing problems or allergies. Noise of mini dehumidifier is below 30 dB with no annoying sound, offer quiet and sound sleeping, which is perfect for small rooms and poorly ventilated areas. ★High-Efficiency: Quickly and efficiently remove moisture from your place, max capability of water tank is 500ml(16 oz), absorb up to 250±50ml moisture a day in 86°F, 80%RH environment. ★Energy Saving: Using Thermo-electric Peltier technology, the mini dehumidifier ensures maximum water extraction with minimum power use.Automatically shuts off when maximum capacity reached with an indicator light, prevent an overflow of collected water. ★Ideal for Small Area: Mini dehumidifier helps to remove the unwanted moisture and odors from the air. Ideal for your bathroom, kitchen, small room, grow room, storage room and RV. ★Easy to Work: easy to operate, connect power, touch power to work. Simple one-button control, easy to use to provide you healthy and enjoyable breathing air.